Collagen supplementation is one of the most fundamental things a person can do to prevent premature aging and promote youthful vitality. Understanding collagen begins with knowing that it is truly the glue that holds the body together; it is the building block for all our body's major systems. SUGGESTED USE: As a dietary supplement, take 3 tablets twice daily preferably on an empty stomach for maximum absorption and wait 30 minutes before eating. Enjoy enhanced results when paired with NeoCell's Hyaluronic Acid products. Our products are naturally based, not synthetic, and are designed to promote youthful health, beauty and total body wellness. We manufacture our own products using carefully sourced food-grade raw materials and our facility exceeds all GMP standards. We strive to continuously bring the best to our customers– products that we and our own families are proud to use, made with Nutrients You Can Trust®. 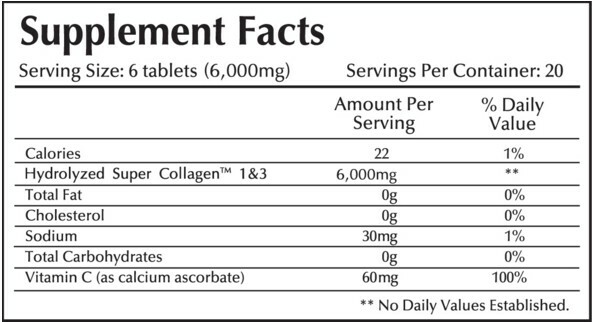 Click the button below to add the NeoCell Super Collagen +C, 250 tablets to your wish list.